I found Cornwall Farm Shops a great alternative to shopping for organic food at a grocery store – the sights and sounds are much more interesting. 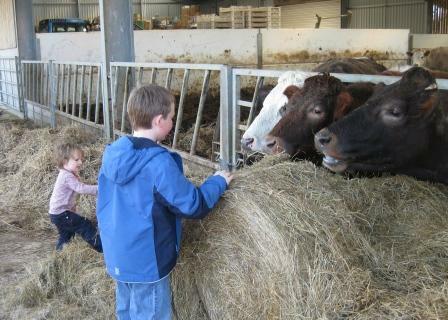 The cows were a huge attraction for BigB and his younger cousin – who was very proud to show us “his farm”. The Long Close Farm is between the picturesque village of Mylor – a mecca for water sports enthusiasts – and Flushing, a short drive from Penryn. For sailing enthusiasts, the Mylor Sailing School offers many courses and classes for new and experienced sailors at any level of ability. This entry was posted in Kid Travel Photos and tagged Cornwall, Cornwall Farm Shops, Mylor, UK, Water Sports on March 27, 2009 by wandermom. Very fun that the cows seem to be interested in socializing! I just commented on another blog that I love cities, but ah, I love the country, too! Nothing like making friends with your food source!